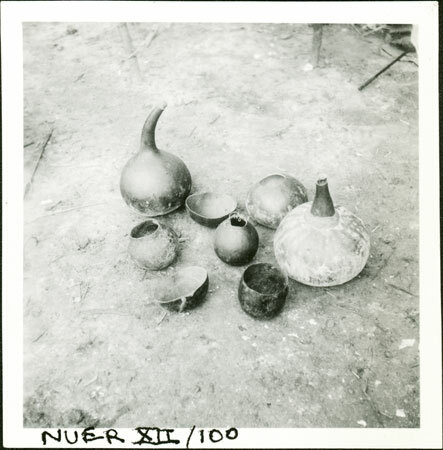 A number of gourd vessels land a pot laid out on the ground, including two churning gourds with stems and more open dishes. The film number seems to suggest a location in Leek territory. Evans-Pritchard spent about seven weeks in total in Nuer Leek country, during Oct-Nov 1936, mostly at Nyueny village among the Karlual section. Note on print reverse ms pencil - "3" & print front border ms ink - "NUER XII/100"
Morton, Chris. "Nuer gourds" Southern Sudan Project (in development). 03 Jan. 2006. Pitt Rivers Museum. <http://southernsudan.prm.ox.ac.uk/details/1998.355.600.2/>.